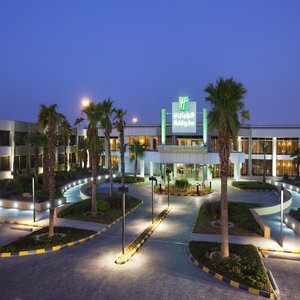 Enjoy a unique location at the modern Holiday Inn Riyadh -Izdihar hotel, midway between King Khaled International Airport and Riyadh city centre. It's a 15-minute taxi drive from the airport to our low-rise hotel set around 2 outdoor pools in a peaceful residential neighborhood. Make use of our extensive meeting facilities, and just minutes from commercial headquarters including SABIC and AL MARAI . Your air-conditioned guest room at Holiday Inn Riyadh-Izdihar is a comfortable home from home with complimentary wireless Internet , tea and coffee. Invite colleagues to your presentation in one of Holiday Inn Riyadh-Izdihar's 8 air-conditioned meeting rooms , all with complimentary wireless Internet. Corporate events are a 10-minute drive away at Riyadh Exhibition Centre, and you can prepare for your meeting in our 24-hour business centre . Experience modern Saudi Arabian shopping at the nearby Gharnata Mall or head for Riyadh's traditional souks in the city centre to haggle for gifts amid heady spice aromas. Ancient history is brought to life at the towering clay fort of Al Musmak Castle , less than an hour from the hotel. Work out in Holiday inn Riyadh-Izdihar's state-of-the-art Fitness Centre or relax with a massage and Turkish bath. Our chefs serve up dishes from around the world at International themed nights in the Jawhara Restaurant .